Unbeknownst to many, the words of historical luminaries contain vast wisdom and relevancy. If you have an emotion, experience, thought or wonder – it has most likely been written about extensively. It’s up to us to seek out relevant knowledge and apply it to our own lives. I recently finished the book, “The Memorable Thoughts of Socrates” by Xenophon ($1). This work recalls the life and teachings of Socrates as told by his pupil, Xenophon. One of the founders of Western philosophy, Socrates wrote at length on an abundance of topics; not limited to, ethics, simplicity, perception, and masculine virtues. Socrates was more than a brilliant philosopher – he championed hard work, fortitude, and patience – characteristics embodied by those who achieve modern-day success. If well written, revelations on human nature have the ability to transcend centuries. 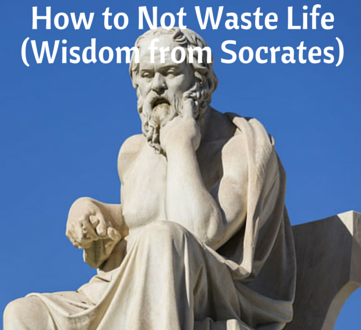 With Socrates – everything he wrote was years ahead of his time. His virtuous discourses sought to examine the depths of the human condition, unlocking fulfillment and purpose in the process. Thousands of years have passed since his death (399 BC), yet his words remain as important as ever. This article will analyze several passages from Xenophon’s book; exploring the wisdom and relevance found in the words of Socrates. All quotes are taken from “The Memorable Thoughts of Socrates,” as mentioned above. For as they who use no bodily exercises are awkward and unwieldy in the actions of the body, so they who exercise not their minds are incapable of the noble actions of the mind, and have not courage enough to undertake anything worthy of praise, nor command enough over themselves to abstain from things that are forbid. Socrates is lamenting the mentally lazy. If you neglect the mind, then you will never achieve anything worthwhile. Think of how many people you know who have simply stopped trying – no longer interested in learning or expanding their knowledge. This disregard for mental stimulation leads to brain rot; in turn, fostering a life full of wasted time and low-level achievements. The mentally weak not only stop growing, but they are also more easily persuaded by vices such as drugs, alcohol, and a life filled with drama. This is a direct result of poor self-control and non-existent self-discipline, both of which are the inevitable concoction of a mindless existence. DO NOT SHUN THE MIND. Always stay learning. Hustle, and work hard. Do not let your childlike sense of wonder and adventure be overcome by stagnant, easy living. But he advised those who had no government of themselves never to taste of things that tempt a man to eat when he is no longer hungry, and that excite him to drink when his thirst is already quenched, because it is this that spoils the stomach, causes the headache, and puts the soul into disorder. We have too many options; an abundance of distractions and an excess of material goods. Most people are overcome by such options and cannot control themselves; thus, why the obesity rate has skyrocketed and the average American is drowning in debt. We eat and drink more than necessary, buy things we don’t need, and make life much more complicated than it was intended (or needs to be). We seek drama and angst, as it makes us comfortable. Self-discipline is more important than ever. The man in control is the man who wins; shun excess and you’ll always find yourself as the leader of the pack. Mental fortitude is key, as those in disarray have lost their sense of way, and desire to be in control. Know that a beautiful person is a more dangerous animal than scorpions, because these cannot wound unless they touch us; but beauty strikes at a distance. Even Socrates himself warned men of the dangers of women – 2000+ years ago! Here, he warns of excess beauty, as it causes most men to act in silly ways in the name of love. Beauty has been used as a weapon for centuries. Combined with charm and seduction, most men have no chance. This reality transcends time. It takes a certain type of man to be able to handle a beautiful woman. Most are easily aroused and awe-struck; inevitably leading to oneitis and a scarcity mindset. It is at this point the woman has won; from here, there will be two outcomes; her complete disgust at such submissiveness or pure glee at the realization of the control she now has. To converse (and sleep with) a beautiful woman – a man must first be in complete control of himself, otherwise risk falling under her deviation spell and charm. Socrates emphasized that beauty can strike from afar – thus be certain you come off confident, experienced, and unfazed when locking eyes with her. Upon the conversation – use the push-pull method – giving a bit, but never seeming too overly interested. Bait her, and hook the beauty on your side, in your control. You must keep frame and maintain an “I’ve been here before” mentality, or else be prepared to leave her in control of the interaction. Socrates vividly describes the advantages we have other other species. Our species, homo sapiens, are masters of the world because of our ability to use logical reasoning and critical thinking (among other characteristics). We have a level of consciousness that is unmatched in the animal world. But what good is this elite level of understanding if we squander it? Our abilities, both mentally and physically, are immense. Yet how many are going through life never tapping into even half of their potential? How many people never push themselves to their limits, even once or twice? We are capable of so much more than we give. History shows as much. It has never been more difficult to choose the road less traveled. Conformity and group-think dominates the Western landscape. To be an outlier feels risky; as though you are betraying those around you in pursuit of a higher calling. It feels unnatural. But you must push your natural talents to the brink, to the utter extreme. It’s only then that you will realize what you are capable of. This is how one finds fulfillment. And to convince you that it is good to impose labours on ourselves, it is a maxim among those who instruct youth that the exercises which are easily performed at the first attempt, and which we immediately take delight in, are not capable to form the body to that vigour and strength that is requisite in great undertakings, nor of imprinting in the soul any considerable knowledge: but that those which require patience, application, labour, and assiduity, prepare the way to illustrious actions and great achievements. Humans have taken a huge leap forward over the past century, and with that, many of us are now accustomed to an easy, abundant lifestyle. We are no longer physically threatened by our environment, although mental and physical detriments have manifested in a new, unique way – via technology. Ask yourself: Are you squandering life? Every day, key decisions are made. Do I go work on a side hustle, or watch that new show on Netflix? Do I read this book on philosophy or play Call of Duty? Am I spending time with my children tonight, or working on that spreadsheet the marketing team needs tomorrow? Although we are ruled by time, we don’t respect time. Ambition is endangered in a world governed by instant gratification and an ever-increasing “no risk, high reward” mentality. Will I waste more time in my life, or will I get up and put in the work I need to be where I want to be in the future? That is the question I ask myself when I feel complacency setting in. The easy life is tempting, for sure. One no longer needs to put forth an extraordinary effort to live comfortably. We can go work our 9-5 and waste every hour in between with little consequence.Relative financial comfort is the new normal, and continues to improve. Each of you is tasked with this question – do you want more? Not just more money, but more out of life; a higher purpose, a stronger sense of direction, a feeling of accomplishment – of a life worth lived. Wasting time now will lead to regret in your future. That much is certain. Legend states that Socrates was one of the first people to recognize his limitations when it came to knowledge. Whether he said this, or not, it raises an important point: We are never truly free until we realize our limitations. We need to be aware that our perspective is not the only perspective; to embrace ignorance is a key step in unlocking satisfaction and fulfillment. Instead of being bull-headed and unruly, I now understand my inherent limitations, but also understand how this can help me become a more well-rounded person. I do not wish to waste life, but instead want to embrace all that I don’t know. This is my maxim for growth. What did you guys think of the article? Any philosophy fans? Leave your comments below!